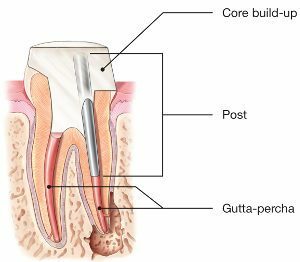 Endodontics is a vital dental specialty that involves preserving teeth, with “endo” meaning “inside” in Greek, and “odont” meaning “tooth”. Endodontic therapy, also known as root canal therapy, specializes in the treatment of the pulp of the teeth. A root canal procedure removes infected tooth pulp and helps prevent the surrounding areas from getting infected. If decay or injury causes inflammation, infection, cracking or pain that could potentially cause tooth loss, a pulpectomy or pulpotomy is recommended. Additional symptoms which may indicate a root canal is necessary include sensitivity to heat or cold that doesn’t go away and tenderness or swelling in the lymph nodes. A pulpectomy removes the entire pulp, whereas the pulpotomy removes only the coronal portion. While the dental pulp facilitates tooth development, it is not necessary once the tooth is mature, making this treatment safe. With abscesses, they are drained and antibiotics may be prescribed to reduce inflammation and infection. While many root canals can be done in one visit, when necessary a dressing may be applied to sterilize and reduce inflammation, and a temporary tooth filling done until you return to complete the root canal treatment. For root canal preparation, there are now several newer techniques utilizing engine-driven instrumentation that far surpasses the mechanical standardized technique pioneered in 1961. Specialized drills, files, loupes, instruments and advanced technologies are now used to remove the pulp and adjacent nerve, which has greatly refined this procedure. Irrigation is conducted using various solutions to break down infected pulp and destroy bacteria, with chlorhexidine and sodium hypochlorite most commonly used worldwide, due to their proven antimicrobial results. For more complex cases, high frequency ultrasound can be used. If necessary, to manage pain, anesthetics and/or corticosteroids may be injected and over the counter or prescription medications may be taken. Once complete, the canals are progressively widened, shaped, then filled with a special polymer and sealed with a dental cement. This is followed by a crown or filling to protect the surrounding tissues. Dental crowns on molars and premolars must cover the tooth cusps to allow for the force of chewing. To prevent any complications, choose a dentist with expertise in their field as proper debris removal, access and shaping with the endodontic treatment, followed by perfectly sealed crowns and dental fillings is a must to prevent leakage and other issues. Annual x- rays to make sure your tooth is problem-free are even more important post root canal since there is no nerve present to warn you of issues. Regular visits to your dentist, combined with proper dental hygiene at home is a must to care for your teeth, as it is for everyone, to prevent further decay.